"A family run business that cater for any occassion, offering quality service and excellent food at affordable prices"
My name is Anne Bunton, and I established Merann Caterers in 1990. Experienced and professional staff, personally led by myself offer an excellent catering service and cuisine to our clients whatever the occasion - Private or Corporate, Business or Pleasure. 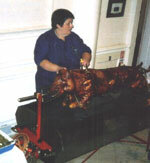 Contact me personally, to discus all your catering requirements. Personalised Menus to suite your Event, please see our Sample Menus for an idea of what we can offer. We can provide a full mobile catering service for any outdoor event.